Why your auctions should be at StampAuctionNetwork. Promote your auctions in the North American Market. 70% of our bidders are North American. The single act of posting your auctions at StampAuctionNetwork is the most effective way to reach collectors who never knew of you, and soon find that you have what they have been looking for. Promote your auctions in your own markets. StampAuctionNetwork is the only web site that allows collectors to narrow their experience by geography or language. Most don't use this feature, but for the collectors that only use auction companies on the continent, or who only bid with German auction houses, this is very helpful. If you are for instance, an Italian auction house, you want to make sure you are listed at StampAuctionNetwork with the Italian auction houses, because if you are missing there, it is noticable. Increase traffic to your website. We will send an announcement of your sale to 16,000 Stamp Auction Newsletter Subscribers! Increase sales in your auctions through increased participation from StampAuctionNetwork bidders and underbidders. You get access to over 25,000 registered bidders who spend real money! Increase the recognition of your auctions. Your sale will be promoted at the #1 web site for stamp auctions, right along with and equal to every other stamp auction, from small to big. StampAuctionNetwork is where stamp collectors go to see new auctions, bid at auction, and track results at auction. You need to be there! Increase your Search Engine Exposure. StampAuctionNetwork is positioned #1 at Goggle and Yahoo when searching for "Stamp Auctions" in non-sponsored results. When you advertise at StampAuctionNetwork, you gain the benefit of our top positioning. Search Engine results are increasingly measured by relevancy, which can result in your own web sites' positioning rise solely due to its presence at StampAuctionNetwork. As of May, 2016 This site averages 4,500 unique visits each day. Since 1994 (22 years) over 7000 Catalogs by more than 228 different auction firms have been posted, totaling over 29 million lots since Stamp Auction Network was started. Typically, there are 800,000 total lots at SAN broken out as 200,000 active/open lots, 400,000 lots with prices realized, and another 200,000 lots that are closed with no prices realized posted. There are over 25,000 active registered bidders at SAN (70% North American - 30% Worldwide). At SAN you have access to over 1.9 million lots each year. SAN bidders make a real impact on Philately, buying $42 million using SAN each year, and leaving bids worth $50 million. If you would like to register to be on our email list send an email to tldroege@StampAuctionNetwork.com and mention "Register for Stamp Auction Network", Please also let us know how you found out about Stamp Auction Network. 1999 - Received the highest award for any auction related Internet site for the 2 first Internet Competitions. Spring 2007 - Live Internet bidding passed $3 Million in one day! 2010 - First with a comprehensive search function. 2013 - First to offer language translation in 50 languages. to date - over 2.4 Billion dollars of stamps have been offered at StampAuctionNetwork. That is more than five times the estimated revenue to date for eBAY in the same time period. Stamp of the Day. Find out more here. Interactive Auctions at StampAuctionNetwork. This harnesses the full power of StampAuctionNetwork. You get the benefits of Universal Registration, Interactive Bidding, Search and Bid. Bids and Customers are transferred to your own auction management system. Your complete auction catalog will be posted at the StampAuctionNetwork, allowing interactive bidding access from around the world. assumes you are hosting your own images. Contact us for 1st Year Introductory offers! Live Bidding with Audio at StampAuctionNetwork. Add to all of the above and let StampAuctionNetwork bidders listen to your public auction and bid over the Internet. Starting at $3,000 per sale. Discounts available for volume committments. 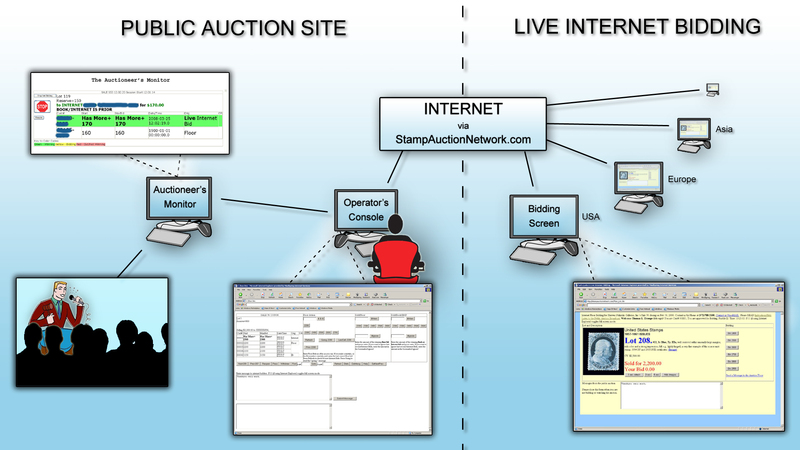 How Internet Bidding at StampAuctionNetwork works. What Live Bidding Looks Like. How to Prepare your Information for us. Provide data in an Excel spreadsheet format. Here is the link to the Excel submission specifications and sample file. Excel Specifications and Sample Call if you have any questions. Provide data on diskette in DBF format. Data must be provided in DBF formatted files according to the HTML and Database Specifications. Call if you have any questions about what should go in any of the fields (they should be fairly self explanatory) You must include one record in the profiles.dbf, any category codes that you are using, and 1 record for each item in the catalog file. See the end of this message for basic DBF formats. ($150 Setup Fee -- may be waived if you do a good job). As a direct link to your catalog as stored at another web site. Fill out this form Auction Calendar Submission Form. You provide ASCII files or another format for which we must convert or reformat. ($150 - $400 Setup Fee depending on the amout of work we must do). If you do the Scanning: Files should be saved as GIF or JPG files and copied to a DOS formatted zip disk or CD. Files should be named "9999.gif" or "9999.jpg" where 9999 is the lot number. Do not 0 fill (ie 279.gif not 0279.gif. Final Stamp image size should be in the 10K to 30K range. Final Cover image size should be in the 40K to 70K range. If we do the scanning: Provide the best quality color photographs, xeroxs, or prints as possible. Specify very clearly which lots are to be imaged and linked to your catalog.